Another photo of the wedding, with all the family members this time. The photo is taken in front of their house above Ireshopeburn and Wearhead, a place called WinterGap. 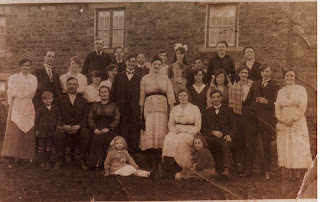 The 2 children at the front are her brother, Arthur on the left and sister Annie on the right. Annie died last year aged 96 and lived in Wolsingham, her married name was Humble.